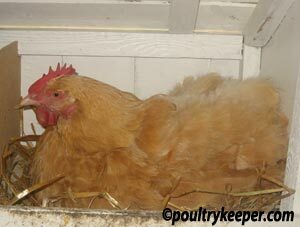 Home » Keeping Chickens » Keeping Chickens FAQ » How Can I Stop a Hen From Being Broody? A hen may go broody and decide she wants to hatch some eggs out herself. This usually happens during the spring and summer months although hens can suddenly decide to go broody at other times of the year too. Not all hens will go broody. Most types of hen that are good egg layers will not go broody since they have been through so much selection during their creation that genetically, they no longer possess the genes that make them want to go broody. Hybrid egg layers usually never go broody for this reason. They were created to lay eggs and when they are broody for 12 weeks or so, they are not laying. It makes no difference having a cockerel in the run, a hen will go broody with or without him present and will sit on eggs whether they are fertile or not. If you want to try to stop a hen from being broody, there are a few methods that can be tried although a determined hen will sit almost anywhere and won’t be put off. 1. Moving her from the nest box. If you keep taking her off the nest, putting her outside, she may decide to give up although this often requires many attempts. 2. Cooling the broody hen off. Sometimes by taking her off the nest and dunking her lower half (underside) into a bucket of cool water until her feathers are wet can put her off. This could be a distraction for her as her instinct is now to dry herself off and preen her feathers by which time she may head straight back to the nest, or may have forgotten about the nest. This should only be done in the warmer months so a hen doesn’t get cold and tends to only work on hens that have just become broody. Combine this with shutting her out of the house or nesting area. 3. Moving her to a new house. The most success I have had is by moving a hen to a small outdoor run I have for chicks. I do not give her access to the house. She is on fresh grass and has water. I ensure there is a lot of corn scattered around to keep her interested. At night-time I place her onto a low perch inside the house in the dark. The floor is bare and there is no nesting material. The next day she goes back out into the run. Once a couple of mornings have passed where she is not sitting but eager to get out into the run for her food, I put her back into the main run. Be careful when re-introducing her to the flock as she may get pecked for a while until the pecking order is re-established. While she is isolated, it is better to keep her close to the flock so they can still see and smell her. This makes the re-introduction much easier. A large dog crate can also be used – place this in the cool / shade and ensure she has shelter, food and water but no nesting material. Place her back in the hen-house over night with the rest of the flock. 2 to 3 days is usually sufficient. This may seem a little harsh restricting her, but in the long run it’s kinder than letting her sit for 5 or 6 weeks to get run down. If you manage to stop your hen from being broody, you will find that she probably won’t lay for a few weeks but this is usually better than 12 weeks or so if she was trying to sit on eggs. If you want to hatch eggs using a broody hen then a determined broody is well worth having. If you don’t want to hatch eggs then you can usually find somebody who wants a good broody hen who may like to borrow her or even buy her. Mother nature is usually the best at incubating eggs! Do you have any techniques for stopping a broody hen? If so, please let us know below.